All Desktop Users. Administrators and Super Administrators may sync any item accessible to them. All other users may only sync folders within their operating system user profile. 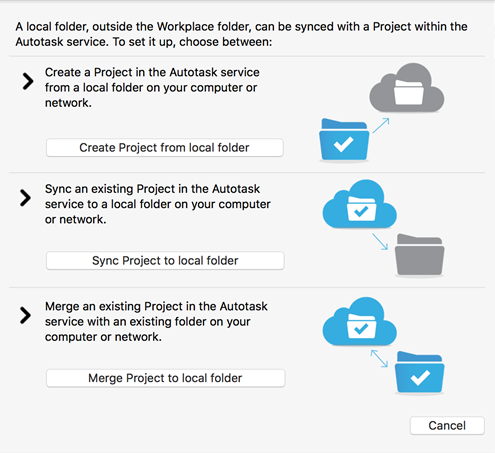 Local folder syncing allows any folder on your computer to be synced with the Workplace"Workplace" describes the Autotask Workplace service in its entirety. service, enabling you to sync projects to the locations most convenient for you. For Administrators and Super Administrators, these folders can be located anywhere on your local drive, an external drive or a network drive. These synced local folders provide all the same features and functionality as a project. In fact, a local folder that is synced becomes a project within the Workplace OnlineWorkplace Online is the web portal that users within a team can use to access their data and administer their team.. In order to ensure successful folder sync, please review File Types That Should Not Be Synced to Workplace. You must be very careful to not use a folder structure that contains file types that should not be synced, e.g. the OS-created Documents folder within your Windows user profile. If you wish to sync to a network drive, be sure to select the folder using the Network section of your file browser. DO NOT use a mapped drive! 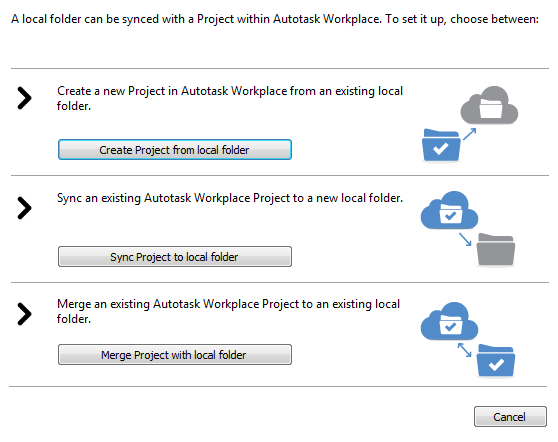 The Folder Sync tab also allows you to merge a local folder with a project. This option is particularly useful if the local folder becomes disconnected from the project. Merging the two will allow them to be quickly reconnected. For instance, if you need to replace a machine that is hosting a Workplace DesktopAlso known as the Workplace Desktop app, and in the context of this documentation, simply "the app," Workplace Desktop is the software installed on a computer that is responsible for synchronizing data between the local drive and the cloud. instance syncing to a network volume, this merge option can be used to get Workplace Desktop on the replacement machine back into full operation very quickly. it resides within the Workplace folder. Click the icon, available from the menu bar/taskbar. If user action is required, the icon will alternate with and exclamation point. Select Fix Sync Errors…. This will open a dialog box that will allow you to correct the path to the project on your local machine or unsubscribe from the project. Pay careful attention to the data within volumes or folders that are synced to projects, taking note of File Types That Should Not Be Synced to Workplace. As a general precaution, we recommend keeping the number of files in a project to less than 100,000. While there is no limit on the number of files a project may contain, performance will be affected when projects exceed the suggested number of files. The larger the file count in your project, the more likely it is that performance will be impacted. For detailed information, refer to the File Count section of Before You Begin: Projects. Click the icon in the menu bar > Preferences… > Folder Sync tab. 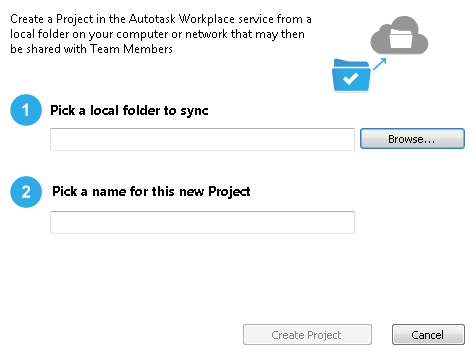 Create a Project from Local Folder - Select this option to create a new project in Workplace Online from an existing local folder. 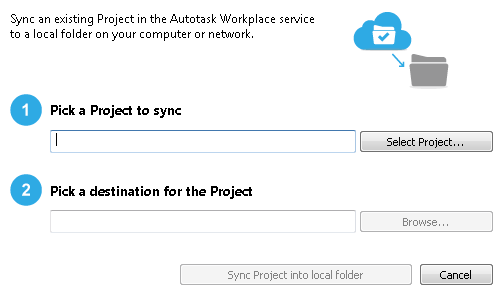 Sync Project to Local Folder - Select this option to sync a project from Workplace Online to a local folder of your choosing. Merge a Project to a Local Folder - Select this option to merge a project with a locally stored copy. This is particularly useful in rare instances where a project must be reconnected with a locally stored copy, such as after a reinstallation of Workplace Desktop. Follow the instructions, below, for the option you select. Enter the absolute file path or click Browse… and navigate to the local folder you wish to convert into a project. Click Create Project to convert the folder into a project and begin syncing. Select the project to sync. Only projects that are not already synced locally will be displayed as available to sync. If you wish to sync a project that is already on your machine to a different location, first the project must be unsynced via the preferences on the Workplace Sync Tab or Folder Sync Tab. Enter the absolute file path or click Browse… and navigate to the location of the local folder that this project will sync to. The local path will be displayed below. 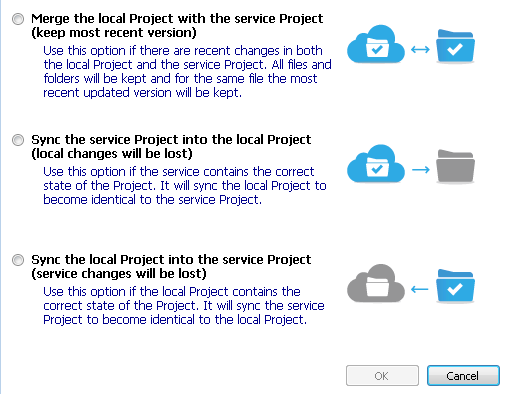 Select Sync Project into local folder to complete the process and begin syncing. Enter the absolute file path or click Browse… and navigate to the local folder to merge. Files will be merged. If files in the same location have the same name, the most recent version will be retained. If the older version exists on the device, it will be deleted. If the older version exists in the Workplace service, it will be available under “Previous Versions”. Any local files that do not exist in the service project will be removed. Any files in the service that do not exist in the local project will be removed. Workplace Desktop will scan all the files in the local folder, compare them to those on the server, and connect all files that match precisely. 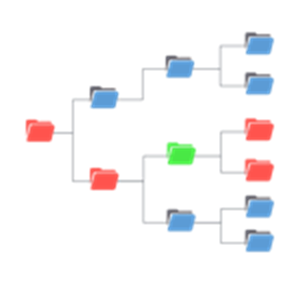 Once all the matching files are connected, a notification will display to confirm that the connection of files is complete and that the remaining files will sync as normal.